The State Department has quietly permitted Tehran to continue conducting sensitive nuclear work, including at a secretive military site that once housed the Islamic Republic's weapons program, despite Secretary of State Mike Pompeo's demand that all such work cease last year. One Republican congressional official involved in the fight told the Free Beacon that for the past week, letters and other initiatives criticizing the administration's nuclear-related waivers have been circulating in both the House and Senate among Iran hawks. U.S. officials who spoke to the Free Beacon about the matter further confirmed that Secretary of State Pompeo, the sole official responsible for issuing and cancelling waivers, has not yet made a decision. This has only fueled greater concern among administration insiders and those on the Hill who fear Pompeo will cave to pro-Iran-deal forces in his agency. "President Trump's designation of the IRGC as a Foreign Terrorist Organization is an important step towards an intellectually honest Iran policy," said Rep. Mike Gallagher (R. Wis.), a member of the powerful House Armed Services Committee. "I hope the administration will build on this logic and terminate sanctions waivers for work on Iranian nuclear sites. The U.S. position should be unequivocally clear: Iran must dismantle its nuclear infrastructure." "Sen. Cruz has always opposed building up Iran's nuclear program, which is what these waivers do, as long as there are unresolved questions about Iran's past nuclear weapons work," he said. "Everything we've learned since the Obama Iran deal was first implemented has deepened his concerns," the spokesperson said, referring to a recent Israeli spy mission to obtain Iran's secret nuclear files. "Most recently the Nuclear Archive showed that Iran had a nuclear weapons program that went much farther than anyone knew. It's time to end these waivers, at least until Iran comes clean. Enough's enough." 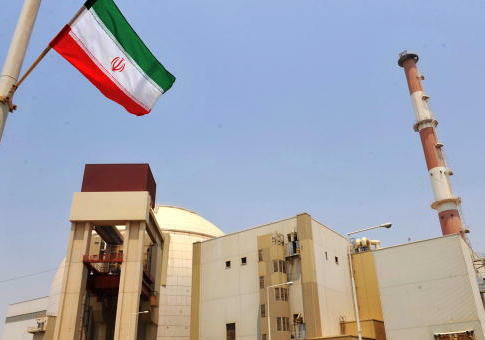 The nuclear waivers have enabled global powers to work with Iran in building up its nuclear program and were originally envisioned by the Obama administration's nuclear deal. The waivers enable work to take place even at sensitive nuclear sites, such as the Fordow facility, an Iranian nuclear site built into the side of a mountain that is nearly impossible to destroy by air. Experts told the Free Beacon that the nuclear archive recently seized by Israel shows that Fordow was part of a larger plan by the regime to create nuclear weapons. Multiple sources placed the blame for what they view as the disjointed policy squarely on the State Department's shoulders. They described a political tug-of-war taking place between longtime government officials who want to save the nuclear deal and those Trump-appointed officials who view it as their responsibility to carry forward Trump’s policy goals vis-à-vis Iran. "The inertia to save the JCPOA [the acronym used to refer to the nuclear deal] is strong within the State Department, and this is the last underpinning of the deal that the people who oppose the president’s policy are clinging to," said one veteran foreign policy insider familiar with frustrations brewing at the White House over the matter. Trump's national security advisor, John Bolton, for instance, is said to be pushing a maximum pressure campaign that is not being received with as much fervor by officials in the State Department. "It looks like they're looking to cave on forcing Iran to dismantle its nuclear program. It's Obama all over again," the source said, speaking on background. "People up here are worried because they've been willing to talk and argue about oil waivers but they refuse to say anything about letting Iran keep its centrifuge bunkers open for business." Behnam Ben Taleblu, a senior fellow and Iranian security expert at the Foundation for Defense of Democracies, told the Free Beacon that disparate messages surrounding the administration's Iran policy will only fuel global uncertainty. "For those who are proponents or supporters of max pressure, moves that keep the JCPOA on life support while seeking to grow a wide-range of penalties against the regime in Iran will read as an inconsistency," he said. "While the norms of nuclear safety and non-proliferation are to be respected and promoted, it is Iran, not Washington, which has grossly and serially transgressed those norms." Washington, he added, "should not be in the business of perpetuating or entertaining the fiction surrounding the rationale for some of Iran’s nuclear sites." U.S. officials "should carefully review what nuclear waivers are a necessity to offset any Iranian rationale for enrichment or contribute to nuclear safety, versus any waiver that ends up legitimizing activity or facilities which should have been prohibited or shut-down a while ago, such as the underground plant at Fordow," Ben Taleblu said. This entry was posted in National Security and tagged Iran, Iran Nuclear Deal, Nuclear Iran, State Department, Ted Cruz, Trump Administration. Bookmark the permalink.